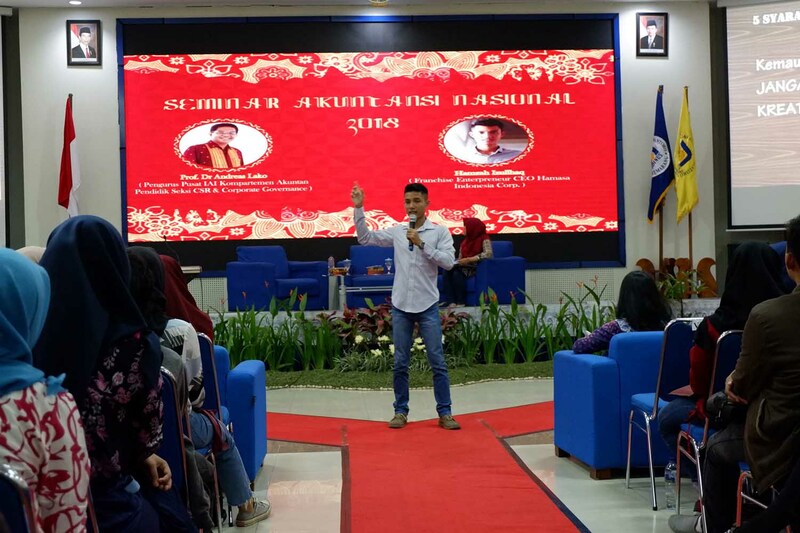 Held on the 3rd floor of E building, the seminar invited two speakers namely Hamzah Izullhaq, CEO of Hamasa Indonesia Corp and Prof. Dr. Andreas Joko from Indonesian Accountants Institute (IAI) as well as Compartment Accountant Educator Sector of CSR & Corporate Governance. Hamzah wanted to spread his strong will of entrepreneurship to hundreds of seminar participants. "Having a strong will, and wanting to rise up again after falling down, is the key to become an entrepreneur," said Hamzah Izullhaq in his speech. Hamzah said that he started many kind of businesses, starting from selling food till tutoring business. He committed to himself that he wanted to be an entrepreneur since he was in high school. He said that strong will was the basic capital in the world of entrepreneurship and also up and down was a common thing in entrepreneurship.